Is a breakthrough in comfort and convenience. This three-panel respirator with innovative design is ideally suited for work settings that involve heat, humidity, or long periods of wear. Suggested applications include grinding, sanding, sweeping, bagging, and other operations that create dust. Uses would also include solids such as those from textile operations, dry chemical handling, surface preparation, food preparation and handling, woodworking, grain handling and milling, processing of minerals, and certain other substances. 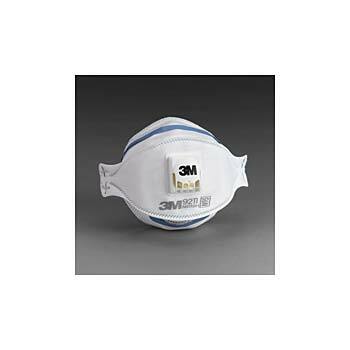 It features a low profile collapse resistant design, 3M™ Cool Flow™ Exhalation Valve, and a soft nose foam pad. Respirators are individually packaged to help prevent contamination during storage.